If your hair is thinning on top, or if you only have a couple of small bald patches, you may not want to go all the way and wear a wig. Fortunately, there's a solution that means you can still enjoy your own hair but make it look even. Hair patches are a new approach to dealing with hair loss, and they can be very effective. You probably already know people who are wearing them, but it's unlikely you've noticed. As the most common place to lose hair is on the top on the head, there's a big market for patches to cover this area. Modern toupées aren't what they used to be and you needn't worry about them clashing with the rest of your hair. When you order a toupée or hair patch you should provide a small sample of your own hair so that the colour can be matched exactly. A real hair toupée looks much better than a synthetic one and the good news is that it's much cheaper than a full real hair wig. Top patches are also made from real hair but are applied differently. They're usually designed to cover a smaller area than a toupée and they're secured with clips rather than glue, attaching securely to the rest of your hair. This has the advantage of making them look more flexible and natural. Top patches are not recommended if you have thinning hair that can be pulled out easily at the roots, as they can put too much strain on it. They do, however, have the advantage of minimising strain on the skin of the scalp, so they're a good option if you have a hair loss condition caused by allergy or a similar skin problem. Because they allow air to circulate more freely, they're a good option for covering short hair as it grows back after Temporary Hair Loss. Woven-in hair patches are similar to Hair Extensions but without the length. 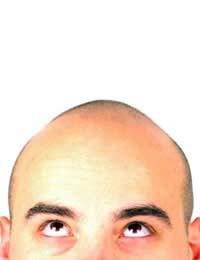 They're ideal for covering bald patches in short hair at the sort of angle where a clipped-on patch would look awkward or fail to work. They work well even for very small bald spots (which can still be striking), and can even be made from your own hair to get a perfect match. Woven-in patches can be attached to your own hair in a salon. They don't look quite as sleek as clip-on patches because the hair doesn't all lie in the same direction, but they do look very natural. As your hair grows you can have them adjusted so they continue to sit in the same place against your scalp, and you can wash your hair as normal when they're in place, provided you don't force a comb through them. Making a hair patch can take several days from the point at which you provide a hair sample, so you'll need to be patient when you order one. There are off-the-shelf patches available if you're lucky enough to find one that matches your hair, and some salons are willing to dye them specially, but this isn't usually a good solution as the dye can fade quickly with washing, leaving you with an odd discoloured area. If your hair is very short with bald patches and you want to make it look even, it's also possible to apply a patch of artificial stubble made using hair you shaved off or clipped. This can be fixed in place with wig glue and touched up with translucent powder to get rid of the shine. It won't give you flowing locks, but it can be a good temporary solution until damaged hair recovers. Find out the reasons why you may be suffering from partial hair loss and what you can do to improve the situation in our feature Partial Hair Loss.